Ready to see a composite shake roof in a new, unique color? The team at This Old House selected our new Black Oak color for the roof on the THIS OLD HOUSE® 2018 IDEA HOUSE! Part of our Nature Crafted Collection, the Black Oak color on our composite shake tiles reminds people of natural cedar shingles that have been saturated with moisture and mold for many years. The color tells the story of dark, aged cedar on a home and looks perfect on the Idea House. Designers for the Idea House wanted to replicate the look of a naturally aging cedar roof, but without the maintenance hassles of real cedar. By recreating the mature, almost black bark coloring on the Black Oak color, DaVinci has provided the project house with the mature-looking cedar color they wanted, but with the durability of a composite shake. “This was the first time I’ve used DaVinci Roofscapes,” says Jeff Sweenor, president and CEO of Sweenor Builders, Inc. “The faux cedar shake tiles in the Black Oak color was the right choice for the THIS OLD HOUSE 2018 IDEA HOUSE color. Located in Narragansett, R.I., the THIS OLD HOUSE 2018 IDEA HOUSE is being previewed in the October issue of This Old Housemagazine. An extensive story on the entire house will be featured in the November/December issue of the magazine. 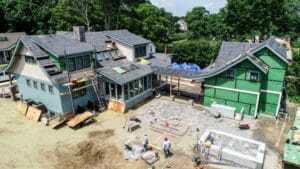 Plus, the Idea House will be showcased in segments of the 2018-2019 season of the Emmy Award-winning TV series This Old House. The 2,700-square-foot cottage was designed by Union Studio Community Architecture & Design. Located less than a mile from the town beach, the home epitomizes what buyers are looking for today: a smaller, maintenance-free home that lives large in a tight-knit community. The seaside location of the Idea House made it important to use exterior products that can stand up to the sometimes harsh weather conditions of the area. 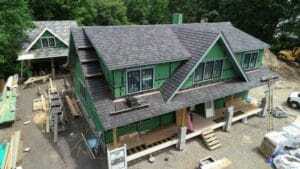 All DaVinci composite shake and slate roofing products resist strong winds, fire, impact, fungus and insects. A Lifetime Limited Material Warranty on the easy-care roofing composite shake product brings peace-of-mind to homeowners. “The durability of the DaVinci product is great — especially for this geographic area,” says Sweenor. “We can get hurricane conditions here including high winds and torrential rain.